We were thrilled to award the Stella & George Bryant Travel Medicine Scholarship to two deserving doctors in 2016. 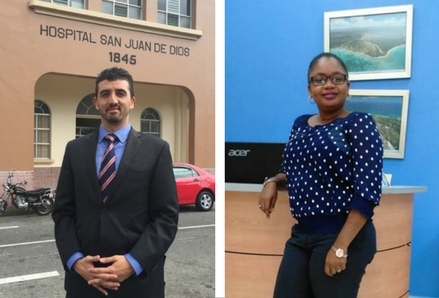 The scholarship enabled Weedgina St Vil of Cap-Haïtien, Haiti and Manuel Villalobos of San José, Costa Rica to take a travel medicine short course at the London School of Hygiene and Tropical Medicine (LSHTM) in November. Weedgina and Manuel also participated in clinical observation at the Hospital for Tropical Diseases travel clinic. We are grateful to Dr. Ron Behrens for organizing the course at LSHTM and making the clinical component possible. Manuel and Weedgina are using what they learned to become travel medicine pioneers in Costa Rica and Haiti. Both plan to introduce travel medicine to the medical students they teach and in Weedgina’s words: “It’s bigger than that.” She sees opportunities to improve care for travellers visiting Haiti and expand travel medicine so Haitian travellers are prepared before going abroad. We found out more about their interest in travellers’ health and their plans for travel medicine in their countries. Tell us about your work. What do you teach at the University of Costa Rica and what common health issues do you see among your patients? I am a physician in infectious diseases and internal medicine in Costa Rica. My main workplace is the Hospital San Juan de Dios (in San José) as a practitioner and the University of Costa Rica as a teacher in infectious diseases. I work with patients from the southeastern part of the country. Some of them are in a very vulnerable social condition. This is associated with HIV, Tuberculosis, parasitic diseases, Leptospirosis and other diseases. In terms of travel medicine, we are a reference centre for infectious diseases and receive patients from many different places. Some of my patients are Costa Ricans planning to travel or returning from elsewhere. Others are visiting our country and have become ill with an acute febrile disease. I see Dengue, Zika, Chikungunya, Traveller’s Diarrhea, Leptospirosis, Ehrlichiosis, and skin diseases like Leishmaniasis. We also have migration to Costa Rica from Africa, Haiti, and Cuba, where I see diseases that are imported into our country, such as Malaria and different parasitic infections. What new clinical standards do you plan to implement in your medical practice? I learned that I have to try at all costs to make sure travellers understand the severity of Malaria. In other countries, people have a fear of Malaria, but in my country (Haiti), despite the presence of mosquitoes, people minimize Malaria and seem to have forgotten how dangerous it is. Clockwise from top: Weedgina at the university where she teaches; Weedgina with Dr. Ron Behrens and nurse Angela at the Hospital for Tropical Diseases in London; Weedgina’s student badge at the LSHTM; Weedgina at a blood donation event with her Rotaract Club. Based on what you learned in the course and clinical observations, what aspects of travel medicine will you teach your colleagues and students? I plan to teach them the importance of travel medicine, including stressing the importance of being up-to-date with vaccines. I will also teach them the topics that are important to travellers such as health risks associated with long plane trips, deserts, cruises, travel insurance, how to better protect yourself from mosquitoes, and how to prevent insect bites in general (not just mosquitoes). What interests you about travel medicine? I love the geographic aspect of medicine and travel medicine as a whole. I did my social service in the same part of southeastern Costa Rica from which I now receive patients and I attend to tourists with many different illnesses. Right now, my work is predominantly in infectious diseases, but I am interested in learning about everything related to travel medicine to improve my medical practice and to teach a course in travel medicine at the University of Costa Rica. What are your plans to practise travel medicine in the future? On one hand, our fellow citizens travel everywhere. Regardless of their level of education or their social status, they have few worries about their destination or endemic diseases they may encounter in other countries. If there are no vaccinations required by the destination country, the traveller’s vaccinations will not even be revised or completed, with the exception of children. In Haiti, we have endemic diseases such as Malaria and Cholera. Despite this, we leave without worrying about health risks we might encounter abroad or bring back with us. We return to see a doctor only when we are very sick. Doctors do not consider recent travel to explain the patient’s medical history – not because of lack of knowledge, but because we do not have this custom. On the other hand, we receive tourists from all over, the majority of whom receive pre-trip consultations and vaccinations before their journey. If anything were to happen during their stay in Haiti, they should be able to find out where to go or what number to call in case of an emergency. I would like to see my country progress in all areas, especially in the field of health. 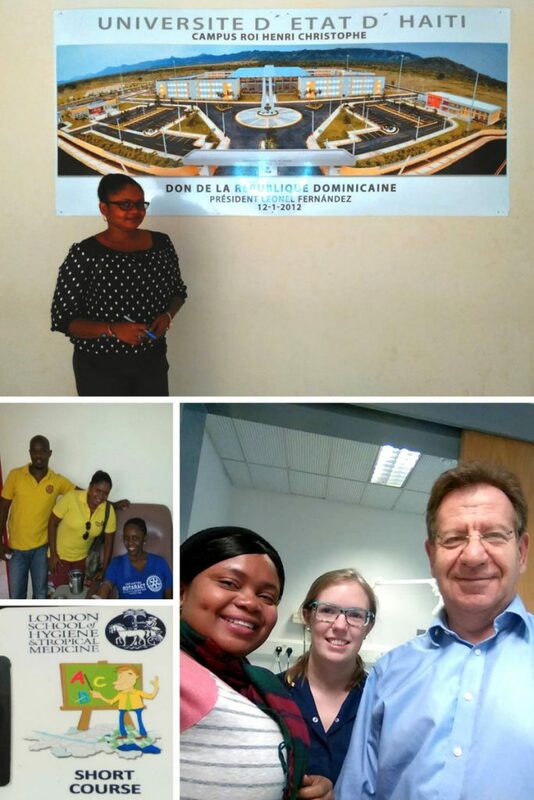 Travel medicine in Haiti will be beneficial for the government, for the Haitian population, for the Ministry of Tourism in Haiti, and for tourists. 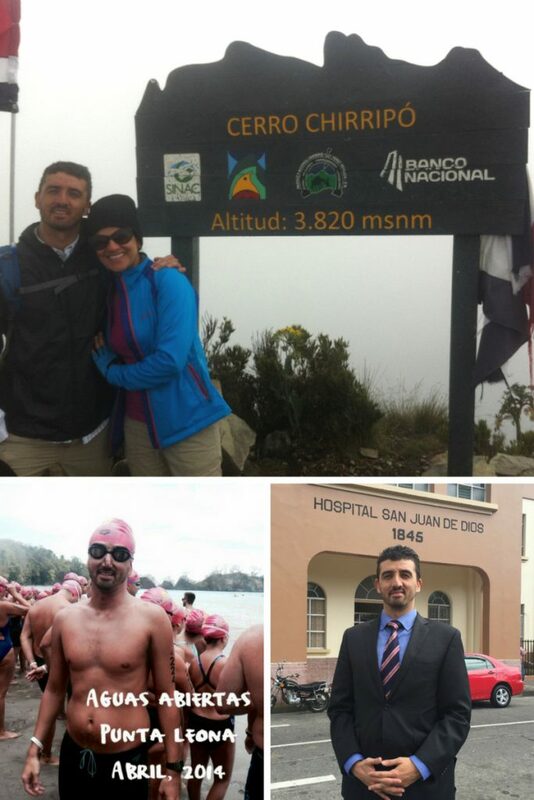 Clockwise from top: Manuel and his wife climbing Chirripo Mountain; Manuel at Hospital San Juan de Dios where he works in infectious diseases; Manuel at an open water swimming event. What do you like to do when you’re not working? What are your hobbies? I have a family with two little kids and I enjoy spending my free time with them. I love sports and practise basketball, running, and swimming. In the last two years, I swam the open water national championship. Last but not least, I love to read Latin American novels and some classics. Photos by Weedgina St Vil and Manuel Villalobos. Through the IAMAT Scholarship Fund, doctors like Manuel and Weedgina can specialize in caring for travellers, giving you better coverage when you travel. They are taking action to improve healthcare for travellers and local patients in their communities. IAMAT scholarships are funded through generous contributions from IAMAT members. Donate today to sponsor a scholar!